Who should not take Vasotec? What conditions does Vasotec treat? Tell your doctor right away if any of these unlikely but serious side effects occur: fainting, symptoms of a high potassium blood level (such as muscle weakness, slow/irregular heartbeat). List Vasotec side effects by likelihood and severity. Before using this medication, tell your doctor or pharmacist your medical history, especially of: history of an allergic reaction which included swelling of the face/lips/tongue/throat (angioedema), blood filtering procedures (such as LDL apheresis, dialysis), high level of potassium in the blood. What should I know regarding pregnancy, nursing and administering Vasotec to children or the elderly? Some products that may interact with this drug include: aliskiren, certain drugs that weaken the immune system/increase the risk of infection (such as everolimus, sirolimus), lithium, drugs that may increase the level of potassium in the blood (such as ARBs including losartan/valsartan, birth control pills containing drospirenone), sacubitril. Does Vasotec interact with other medications? 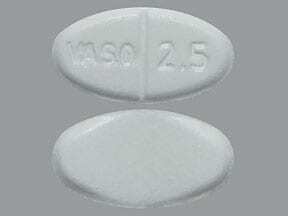 This medicine is a white, oval, scored, tablet imprinted with "VASO 2.5". 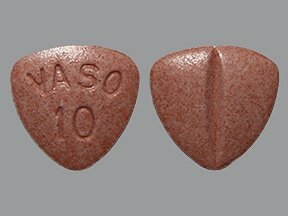 This medicine is a rusty red, triangular, scored, tablet imprinted with "VASO 10". 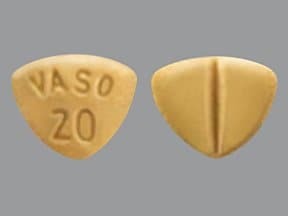 This medicine is a peach, triangular, scored, tablet imprinted with "VASO 20". 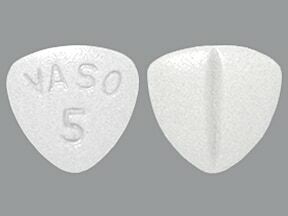 This medicine is a white, triangular, scored, tablet imprinted with "VASO 5". 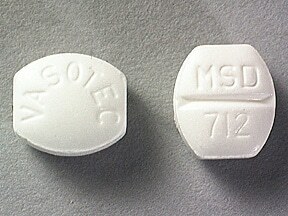 This medicine is a white, barrel, scored, tablet imprinted with "VASOTEC" and "MSD 712". 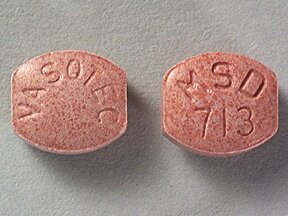 This medicine is a salmon, barrel, tablet imprinted with "VASOTEC" and "MSD 713". Are you considering switching to Vasotec? How long have you been taking Vasotec?